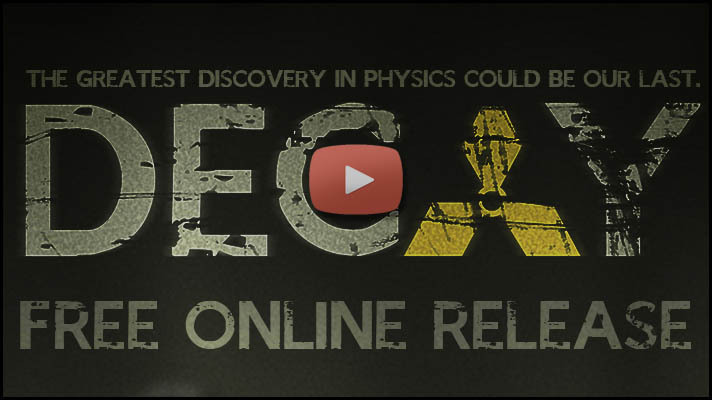 DECAY is a zombie film made and set at the LHC, by physics PhD students. It is available for free online, under a Creative Commons license. Watch the trailer above or at YouTube. To find a screening near you check the Events page. This film has not been authorized or endorsed by CERN. Thanks to the hard work of our team of translation volunteers, we’ve got foreign-language subtitles for you! They’re on the download page, or you can view them on the YouTube video directly. Currently, we have English, Español, Ελληνικά, Français, Italiano and Português (Brasil). It’s exactly 28 weeks later (divided by 2) and we’ve passed one million views on youtube!! Here’s a blooper reel to say thank you to everyone who watched and shared! Decay is now available for free download, torrenting and streaming! Check out our download page for various options. It’s been a long time and a lot of effort making this film, and it’s great to have it out the door! We hope you enjoy it. The film is licensed under Creative Commons Attribution-NonCommercial / CC-BY-NC, which means you can freely copy, share and re-use the film however you like. You must however credit us, and cannot make money with the film or any project which uses the film. The credit should be ‘“Decay” by H2ZZ Productions’ or similar. If it’s online, a link to this site would be much appreciated! There will be showings this week at several locations in the UK, US and Germany. Take a look at the Events to see if there is a screening near you. Please note that some of these are only open to local staff and students.